It’s the Orient Express IN SPACE, and it’s providing the setting for Clara to come to terms with her decisions from the last episode. The Doctor takes Clara to the Orient Express IN SPACE. Unsurprisingly, there’s a fresh corpse, and a monster. We really are sure now that the Doctor deliberately chooses destinations that aren’t boring. i.e. they’re incredibly dangerous. The Doctor being arrested part of the plot was resolved so quickly it would’ve been far better not to have it at all. I’m not sure how original it was. Each individual element is something I’ve seen elsewhere, but I don’t think it’s a combination I’ve seen before. Three out of six. The effects were relatively minimal. Interior effects work was generally well done, but the exterior shots of the train were disappointing. Four out of six. The story is a basic monster of the week plot with a bit of Clara’s character development thrown in for good measure. It’s all competent, but there’s nothing special here, and the characters are fairly one-dimensional. Four out of six. The acting isn’t objectionable, but everyone’s mostly just playing to the stereotype that their character is written as. Four out of six. The production is mostly wonderful, but I felt the music while the mummy attacked was back to the excesses of the previous series, which rather diminishes the impact of various dramatic moments. I still suspect this is deliberate – they don’t want to make the show too scary after all – but as an adult I can’t appreciate it very much. Four out of six. An emotional response flickered a little in the depths of my heart at one point, but it didn’t really go anywhere for me. The ultimately formulaic nature of the plot diminished my ability to actually care about it. Four out of six. Overall, it was perfectly watchable but not at all special. Four out of six. In total, Mummy on the Orient Express receives thirty-one out of forty-two. Nice touch during the scene where the Doctor was arguing with himself, one side was Capaldis normal voice, the other side he was doing as a Tom Baker voice. The music point is fair, though the monster was a deliberate cliche, made up effectively as one, and the music suited. And speaking of music, how about Foxes sings Queen as jazz? Overall, I thought this was a decent take on a classic type of Doctor Who ep, with a limited setting, historical costumes, a mystery, and a Monster on the Loose. 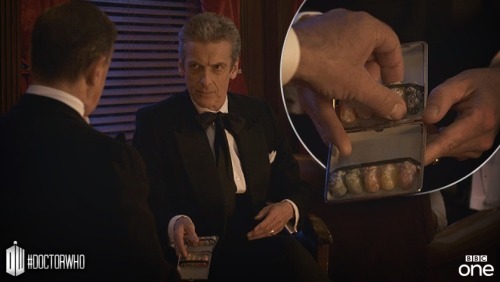 I like that he referred to the phone call in the TARDIS about the Orient Express in Space, although then it was an Egyptian Goddess…. Also, I was expecting the ones who died to show up with Missy…. It doesn’t get bonus emotional response points for the return of the jelly babies? Is Capaldi wearing his wedding ring in that shot?